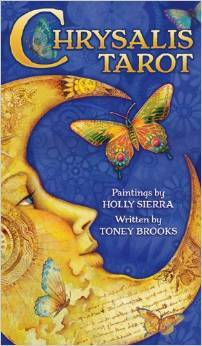 The “Chrysalis Tarot” is a 78 card Tarot deck that comes with a 60 page companion book (LWB). It follows traditional format, with the following changes. The deck and companion book come in a beautiful box with an image of the moon and butterflies on the front, and the Page of Mirrors (The Healer) on the back. 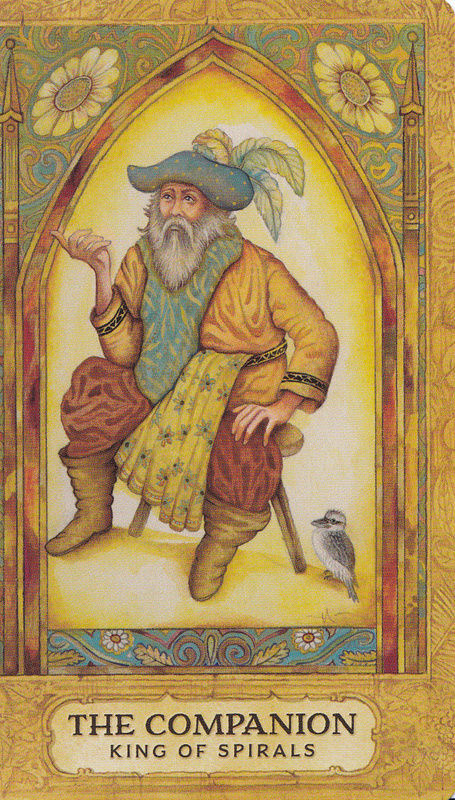 In his introduction, Brooks talks about the concept of achieving your destiny in the Tarot. He also talks about the balance between ego and psyche. The characters found in the imagery of this deck represent Otherworld characters and archetypes (Major Arcana), as well as the day to day of life … inspiration for personal reflection, intuition, and imagination (The Pips/Numbered cards), and the troupe of medieval troubadours, representing real life messengers (the Court Cards). The cards are presented by text only (no images). Each Major Arcana card includes the new title, the traditional title, attributes, and a discussion of the card, and the symbols within it. Each Pip (numbered card) includes the card number, suit, keyword, and a discussion of the card. 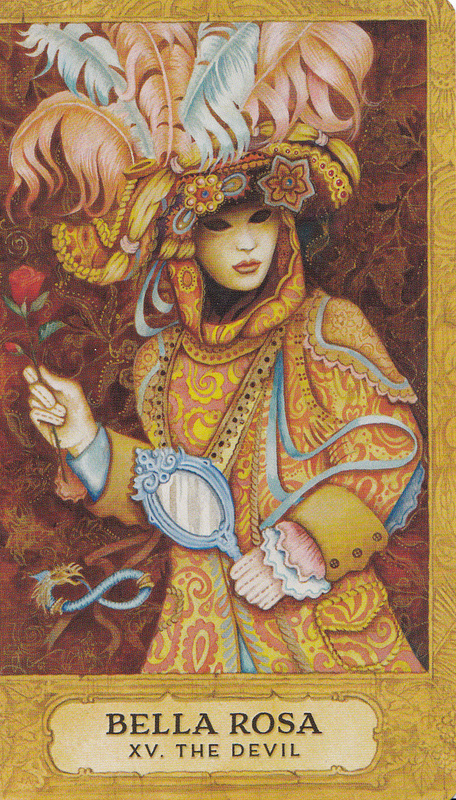 The Troupe (Court) Cards include the new title, the traditional title, attributes, role, and a short discussion of the card. Sorceress Morgan Le Fay is pictured in vibrant hues of mysticism and magic. Her talisman represents the pomegranate, food of the Otherworld, and a symbol of the Triple Goddess. We can feel the fruitful energy swirling in the background as it explodes in a crescendo of bursting light from Morgan’s hand. Woven spirals symbolize the infinite transformative energy of the sorceress. In your reading, Morgan points to one of your challenging encounters in attaining transformation. Morgan does her magic as the curtain that separates the seen and the unseen worlds. The ravens, insatiably curious when magic is active, swoop in to flavor her cauldron with magical synchronicity, those coincidences that confirm you’re on the right track. At the end of the companion book (LWB) a five card Pentagram spread (including significator) is presented. The cards are 2 ¾” by 4 ¾”. 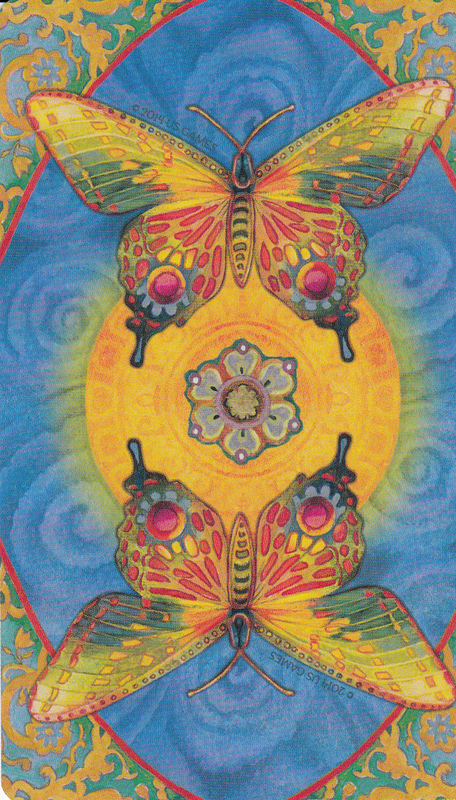 The card backs show gold and blue imagery in each of the four corners, with a blue background in the center, covered in spirals. In the center of the card is a gold circle, with a mandala in the middle. Multi-colored butterflies appear on either end of the gold circle. The cards are reversible. The card faces shows a gold border, with the new title and the traditional title in black lettering against a white background at the bottom of the card. The coloring on the cards is a beautiful pastel, with the imagery drawn from myth, Celtic, Pagan, Egyptian, and VooDoo traditions. 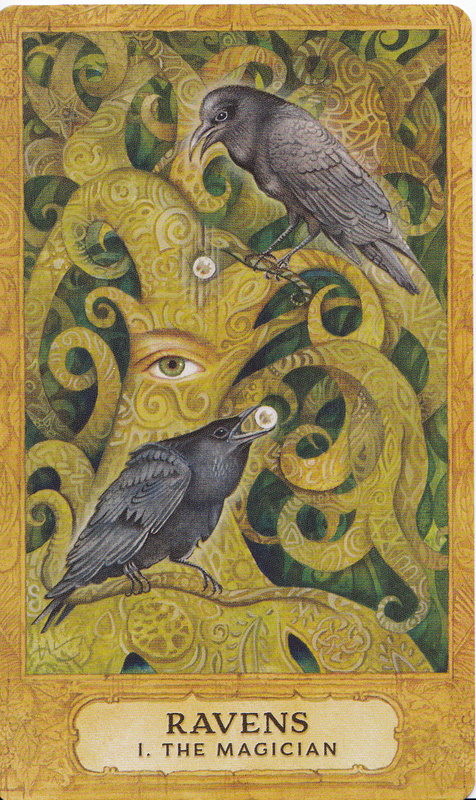 In Ravens (The Magician), we see black ravens sitting in a tree that features an open eye in the trunk. They are playing a game with pearls, which represent moonlight, mysticism, and synchronicity. One of the cards that I feel represent the traditional archetype well if Green Man (The Emperor). 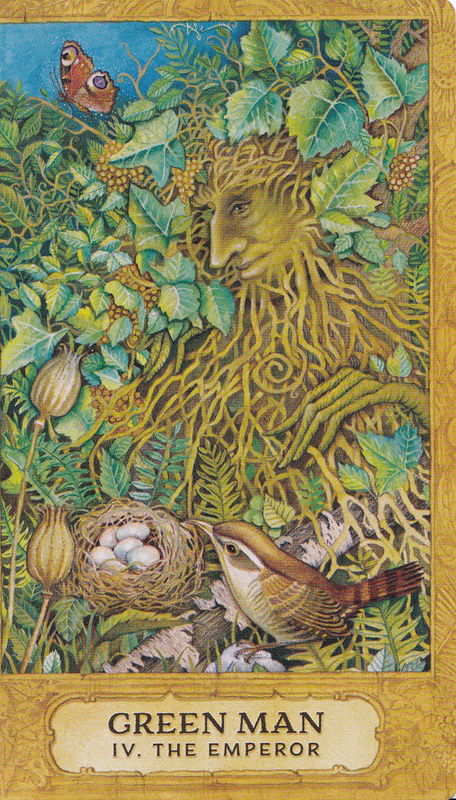 We see the face of the Green Man in the foliage, looking down on a birds nest, with his companion butterfly in the upper left hand corner. A beautifully done hat, while carrying a rose in her right hand, and a mirror in her left hand. We see an infinity symbol to her right. The Aces are very simple cards. 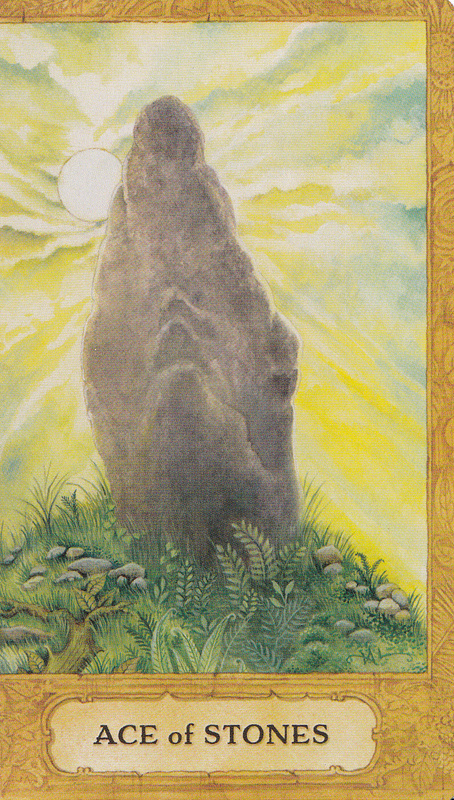 The Ace of Stones shows a sacred megalith. 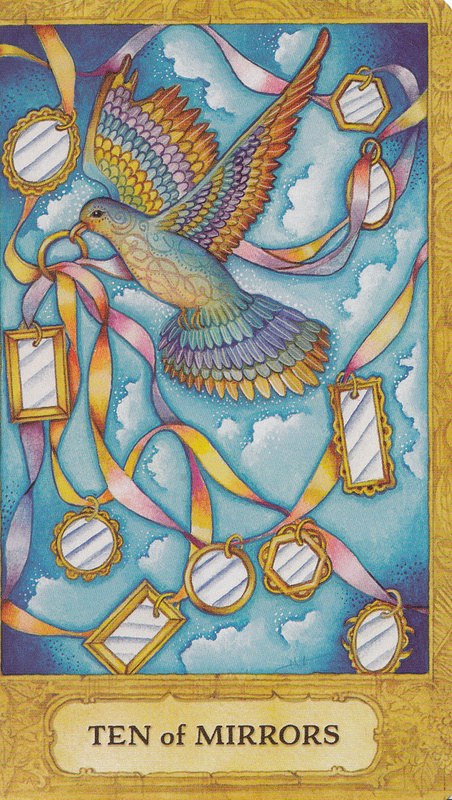 The Ten of Mirrors is a beautiful card, showing a rainbow colored dove of peace in flight in the center, against a blue background. The dove carries ten mirrors that represent an emerging new cycle. The Pilgrim (Page of Scrolls) shows a figure dressed in a lilac tunic with a darker lavender skirt. 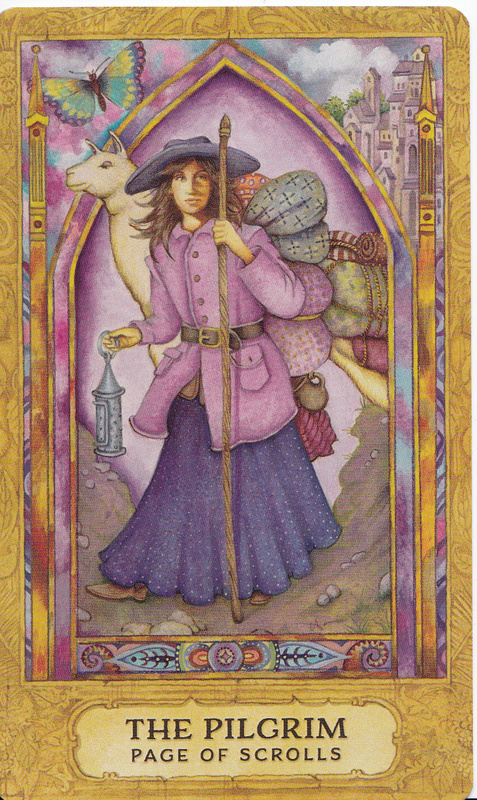 She carries a lantern in her right hand, a staff in her left. In the upper left hand corner we see a butterfly, with an animal of some type behind her right shoulder. The Companion (King of Spirals) shows a male figure, seated on a stool, with a small bird at his feet. 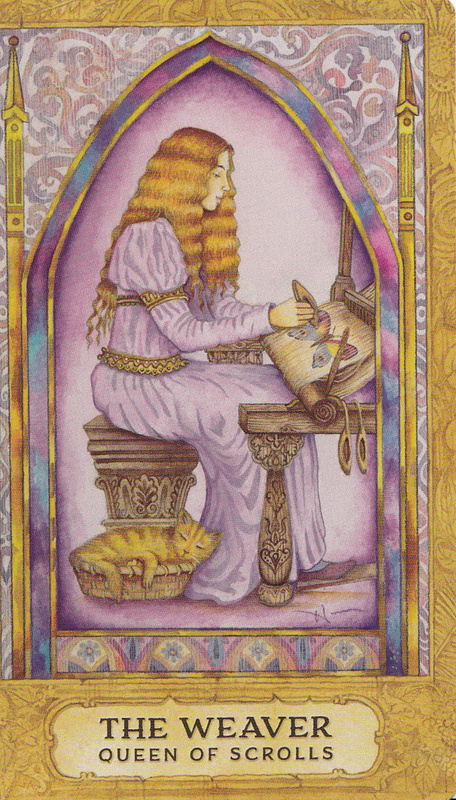 The Weaver (Queen of Scrolls) shows a female figure, in a light lavender dress, at work. There is an orange tabby cat in a basket at her feet. I found the imagery well done, but not always reflecting the traditional meaning (such as the tear the Sun is shedding). The inclusion of both the new title and the traditional title on the card to me is disruptive. If you want to retitle a card, then use that title, and that title alone, on the card. Redefining the Court Cards as Troupe seems to diminish, rather than expand, the nature of the card. I found this deck nicely illustrated, and the notes in the LWB well written. While this deck is easy to read with, I would not use it as a learning deck. Reproduction prohibited without written permission from the author.